Samsung Galaxy Beam is a smartphone that would rather like by any one because it as the excellent features to get impression by the most of the people. On the same catogery, same type of smartphones were entered into the market of Singapore. It is different from other phones mainly in the matter of projecting the image at some distance. 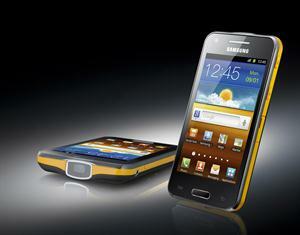 People would like this model of smartphones as the following features that Samsung Galaxy Beam smartphone has. After seeing the above features, one can really attract to this phone because in any dark place we can see any movie or photos on wall or any other obstacle by projecting them. This is the novel phenomena of Samsung, but the price of this smartphone is not out yet. Samsung team would like to think in new dimension to make the customers to see even T.V. programmes on the ceilings and also they would expect that an alarm to be fixed up in this smartphone to show the colourful images when the alarm is on. There are different methods to project the picture on external environment in which demo mode is obviously correct. In other methods, handling of this smartphone is something trouble because this smartphone is very delicate. As it is a touched screen so it have facility to project movies and photos by touch screen mode. Generally, other cell phones have camera, MP3 and internet services, but Samsung Galaxy Beam smartphone has the special feature of projecting movies in near surface. Samsung Galaxy Beam is one of the best projector phones available in India.Read this review of this projector smartphone and also the price details.